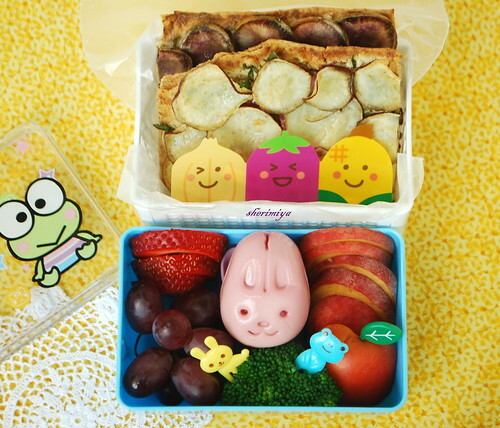 Pink Bunny Pizza Bento, originally uploaded by sherimiya ♥. Sweet potato pizza was for dinner and I made some extra for MisterMan's bento. I adapted the recipe from Gourmet Mom on the Go. It's easy and quick to make, and it really does taste great! Really! Drizzle olive oil on your crust and spread evenly with the cheese and roasted garlic. Layer the peeled, thinly sliced potatoes over the cheese. Sprinkle with garlic powder and herbs, if using. Bake at 425F for 18-25 minutes or until potatoes are soft and crust is crispy. One of the best things about this pizza is that you can hide any number of goodies under the potatoes. My 3 year old will pull off all the spinach if it's sitting on top, but this way she never even sees it. It's awesome. I put two pieces of pizza in the basket part. These were baked on soft lavash, which crisped up very well. The one in the back has Okinawan purple potato, and the one in the front has satsumaimo. In the lower tier I put my pink bunny molded egg. You can see the details on this one better, whew! It helps to dye it in beet juice, I think. I also added some white peach, a half apricot, half strawberry, red grapes and a sprig of steamed broccoli. Yummy! Now THAT'S a filling lunch to me! Oh yeah! Am writing this meal down. That's a molded shaped egg?? I thought it was just a plastic showpiece. Haha! That's amazing! Also love the Keroppi bento! Oh my goodness, I must have this pizza! Sweet potato is my favorite food in the world! And putting it on pizza is genius!! Lunch looks amazing and so cute too with the little bunny! I love the changes you made to the pizza! I'm totally trying hiding stuff under the potatoes, GENIUS!!! :) You are amazing, lady! Wonderful! I love marscapone it's so versatile! Super cute pink bunny too! HEHEHEHE My little one has to disect everything before she'll eat it so no joy in hiding it... but I always win with soups and sauces.... once pureed with the hand blender ... they never know! Nom nom! Love the bento, love the oven-crisped lavash--brilliant notion! Thanks for another cheering, delightful bento adventure Sheri! Chantale, this box is awesome, Keroppi rocks! I hope you can try the pizza. It requires basically no prep time and it's so easy too. Thanks! Thanks Jenn! 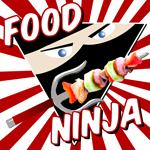 Lucky you to have such a healthy Favorite Food in the World!! Then you really must try it on pizza! Hi Mandy!! Thanks for supporting my *edit* of your fabulous recipe! We love this pizza and I'm so happy it's a healthy version of a classic favorite food around here!! Thanks Karen! Beet water (after boiling/steaming) works great as a natural food dye. Angi, you're right, they're so sneaky but no match for the mama with the blender! Hi tatabonita! He's happy to share, anytime! Thank you dear!! Mommyof2girlz: Thanks so much for following!! Hope you can use the recipe and find it as yummy as we do. Beet juice is my favorite natural dye. Golden beets are also awesome for yellow color. would never have thought to put sweet potatoes on pizza... but reading those ingredients, it sounds like an absolutely delish combo. you are always so clever with keeping your kids' food *healthy*... hiding the spinich, using natural dye (beet juice), etc... but absolutely never to the detriment of total cuteness! This idea of Mandy's is so awesome. I even made another one today and cut it into little "appetizer" portions for them to munch on as a snack. Total win. Yeah, totally sneaky mom trick, heh. Thanks Rachel! It's reallly good, hope you can try it!